Growing up in Northeastern Pennsylvania, I dreamed of becoming a veterinarian since grade school. In 1990, I graduated from the University of Georgia College of Veterinary Medicine attaining my lifelong dream of becoming a veterinarian. I enjoy practicing small animal veterinary medicine as a relief veterinarian and the diversity in professional experience this career choice has given me. 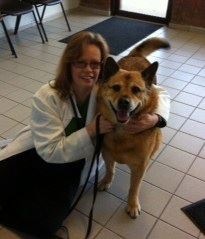 "Nikita" or "Nikki" - Rescued Chow Shepherd dog - Unfortunately, due to liver cancer, Nikki was euthanized in June 2013. She is sadly missed everyday. 'Whitney" and "Teto" - two sweet cats that shared my life in veterinary school and for many years afterward.